Airship automatically collects data from your users’ devices, storing them as device properties. Device property tags are used for Targeting Your Audience. How the tag group is displayed within the dashboard. The ID used to refer to the tag group in the API. The tags contained within the tag group. A special tag that is equivalent to "unknown". This push goes to all devices with unknown language settings. There are no sentinel values for Background Enabled, Location Enabled, or Notification Opt-in; every device will be tagged with either "true" or "false" for each of these groups. 2 The Location Enabled tag group only contains devices with SDK 6.0+. 4 Please see Locale below. A time zone (timezone) tag is identical to its UI name. This is not a full list of possible device time zones. If a device has a time zone setting that is not listed below, our system will attempt to resolve it to the nearest available time zone, then tag the device accordingly. SDK version tags are in format #.#.X, e.g., 4.0.X. We do not allow targeting of specific patches, such as 4.0.1. The tables below show the available SDK version tags for both iOS and Android, along with with the range of SDK versions corresponding to each tag. For more information about the differences between SDK Versions, please see our Android and iOS SDK changelogs. An SDK version tag is identical to its UI name. Platform version tags are in format #.#.X, e.g., 1.6.X. We do not allow targeting of specific patches, such as 1.6.6. For more information about the differences between various Android and iOS versions, please see Android version history and iOS version history. A platform version tag is identical to its UI name. A model tag's UI name appears in the dashboard when using Target Specific Users or Target Specific Users: In-App Automation. Many use cases do not require the granularity of targeting devices by cellular technologies, e.g., CDMA/ or GSM. To avoid having to select each tag when you just want to push to a certain device, you can create segments via the API that group the related tags together. Looking at the iOS Model table above, the first device that encompasses multiple tags is the iPad 2, which has separate tags for the Wifi, Wifi/GSM, Wifi/CDMA, and Wifi 16GB versions. You can create a segment that groups these tags together. JSON payloads for the remaining iOS devices that encompass multiple tags. A device's locale is determined by its language and country settings. Target a specific locale via tag groups ua_locale_language and ua_locale_country. Keep in mind that a device's language and country settings imply nothing about the user's actual language or location. E.g., an English speaking citizen of the US could set the phone's country to China and language to Arabic, and the device locale would reflect those changes. It is best to think of ua_locale_country and ua_locale_language as useful approximations only. On iOS, the locale is a combination of the iPhone Language and Region settings. Converting the example in the image below using ISO standards, this iPhone has a locale of en_US. 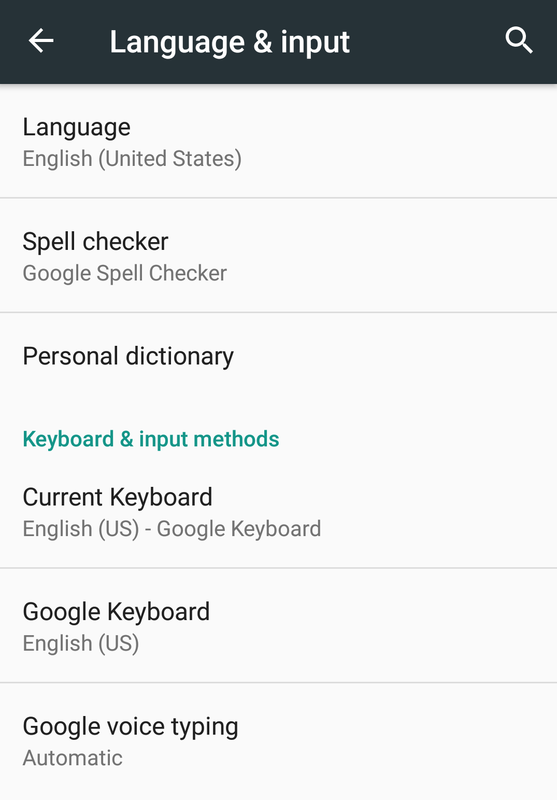 With Android devices, you choose the language/country combination together. 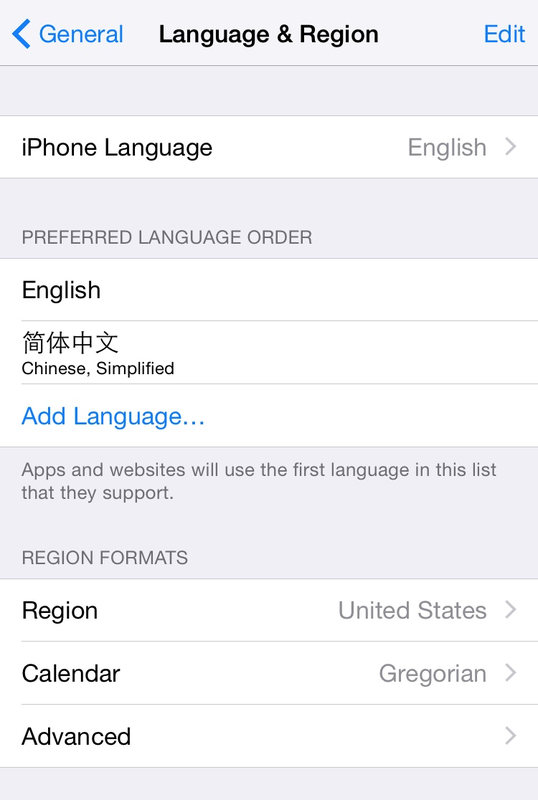 Unlike iOS, there are no separate menus for region and language. Translating the information in the image below using ISO standards, we have another device with locale en_US.